The Green Bay Packers are still looking for a couple of good men. Eight games into the NFL season and a 7-1 record, the Packers still have problems on the offensive line and coach Mike McCarthy is holding open tryouts at left and right guard. The starters right now are Daryn Colledge (pictured) and Jason Spitz, while the challengers are Junius Coston and rookie Allen Barbre. Mike McCarthy wasn&apos;t happy with the number of times Brett Favre got hit in the Packers win over the Chiefs on Sunday. There&apos;s a good chance Coston will get the job back at right guard. He had the starting spot until an injury sidelined him recently. Colledge had a terrible game against the Chiefs, perhaps the worst of his young career. Colledge allowed three quarterback hits, got pushed around all day and committed a pair of penalties. 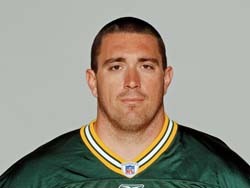 It&apos;s not clear what way the Packers would go if they replace Colledge.